(PhysOrg.com) -- While some comics today are still drawn by hand, many modern cartoonists use a variety of digital tools to create comics. But even with the help of these tools, creating comics is a time-consuming task that requires many human hours of work. 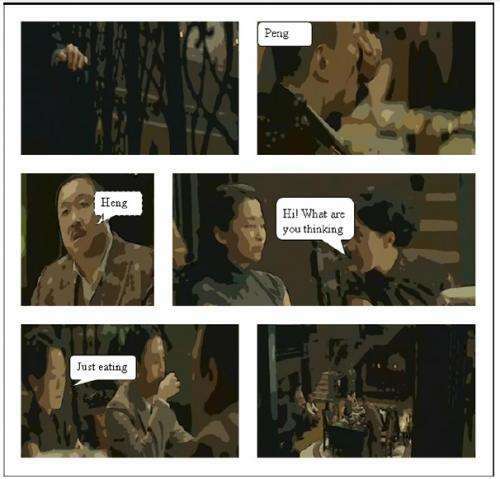 In a new study, a team of researchers has designed a program that can automatically transform movie scenes into comic strips, without the need for any human intervention. Meng Wang, a professor at the Hefei University of Technology, China, and coauthors have published their study on the new software, which they call Movie2Comics, in a recent issue of IEEE Transactions on Multimedia. As the researchers explain in their study, previous programs have been developed to assist cartoonists in converting movies into comics, but the new method is the first fully automated approach. Without the need for any manual intervention, the method has the potential to significantly cut the time and expense associated with creating comics. The new cartoonization process involves several steps, including an automatic script-face mapping algorithm that identifies the speaking character in scenes with multiple characters, automatic generation of comic panels of different sizes, positioning word balloons, and rendering movie frames in a cartoon style. 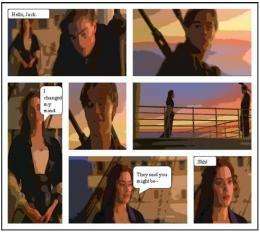 The researchers used the new method to transform 15 movie clips into comic strips. The clips came from three movies  Titanic, Sherlock Holmes, and The Message  and varied in length from 2 to 7 minutes. Although the method performed the transformation well for the most part, it sometimes put word bubbles next to the faces of incorrect characters. The script-face mapping algorithm had an accuracy of 85%, which the researchers hope to improve. The researchers then conducted a user evaluation to see how well users understood and enjoyed the comics. They found that users had a slightly lower content comprehension of the comics compared with the original movie clips. Although some loss in comprehension is inevitable when converting to a different format, the script-face mapping errors also played a role. As for enjoyment, the user evaluations showed that enjoyment was highest when the comics included word balloons and effective layout and stylization. Although the technique is capable of performing all steps automatically, the researchers noted that involving some human effort could lead to even better results. In such a scenario, the software would provide recommendations for each step of the transformation process, and humans could manually adjust the results much more quickly and efficiently than in pure manual methods. But the researchers also hope to improve the accuracy of the automated method. Hand drawn cartoons are art created by artists. This looks like crap. Degenerated photos are not cartoons. The technology may have its uses, but as comics it's a FAIL. Somebody do the State of the Union speech,... please. The software has to replicate the speech patterns like "aaaannnnd". That would be funny. I found the watching of many movies a waste of time and reading of subtitle files counterintuitive to the actual content of movies. Background image is worth of thousands words after then. This technology could become useful for automatic generation of excerpts from movies. The better not mess with the fantastic artwork of modern anime. Hi i think the invention is very useful, and think that the guys do great job, don't critique instantly (to others), i see here a huge business opportunity. Please tell how i can contact with the creator of this software and is there any prototype put online?